This is the end of my fifth season. I started in the spring of 2013. What was the impetus to pursue farming? My husband and I fell into farming in a way. We were looking for a way to work outdoors and find meaning in our day-to-day lives, rather than feeling stuck in the monotony of the rat race. We figured we would try a farm "internship" and see how it was, and here we are! What did you do to prepare/educate yourself for this new role? We read a lot of books, including several by Joel Salatin, since we knew we wanted to focus on animal husbandry. Over the years of farming we've read many more books and watched countless YouTube videos. We also made friends with other farmers so we could all learn together. 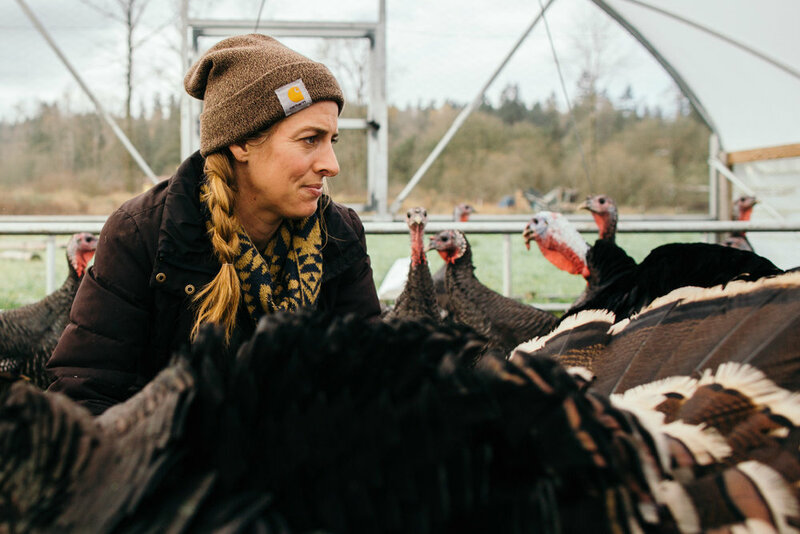 Our backgrounds actually helped prepare us more than we expected; my sales and marketing background and artistic eye come into play every day as I work to sell the meat we produce (and sell our story!). My husband had a background in construction, and I can't imagine farming without a partner who is capable of building things with his (or her!) hands. What skills do you use that you did not expect? What is your biggest challenge? It seems obvious now, but I didn't know how much logical thinking and problem solving would be involved in farming. I've always been more of an intuitive, intellectual type person. I was never interested in taking things apart and learning how they work, because I never needed to. One of my initial challenges was that I had a hard time thinking along those lines, and was always asking my husband for his input which really slowed both of us down. Farming has seriously helped me expand into this other region of my brain, where I stop and think more critically about the tasks at hand and how I can be most efficient. Sometimes I come up with farming ideas that surprise me because in my past life I never would have thought of that kind of solution. I also developed really strong hands, which I put to good use every single day. My wedding rings no longer fit my muscular fingers, but I am proud of my grip strength! Are there any specific challenges/disadvantages in being a female farmer? Farming is inherently physical, and animal husbandry is hard labor. There is a lot of heavy lifting and carrying (feed bags, buckets of water, ornery goats), and as a petite woman I do sometimes feel like I have to work twice as hard. What are the benefits/advantages in being a female farmer? This one is hard, because I don't want to fall into the trope of claiming my female intuition and nurturing side help with animal husbandry, but in a way it's true. It might not be because I'm a woman, but I do have a strong intuition for my animals' well-being, and I often notice things that seem off before my husband does. What do you see as the biggest impediment to women entering the field of farming? 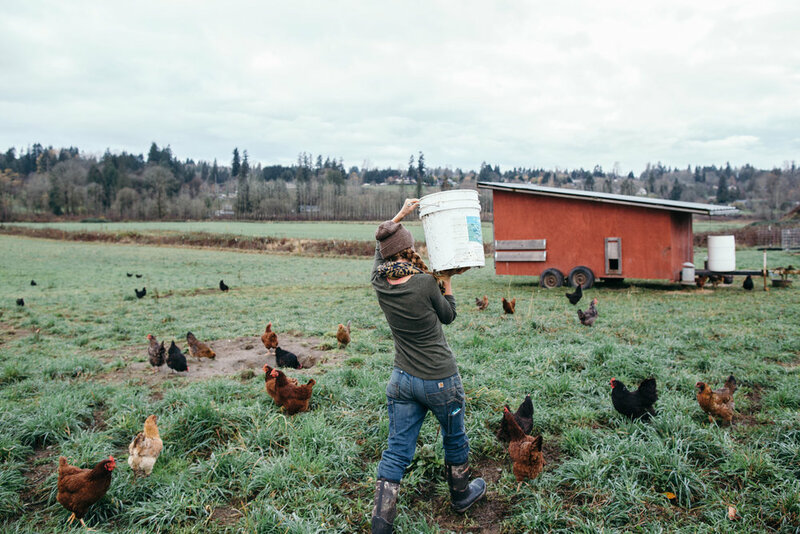 In my little bubble of Western Washington agriculture it seems there are very few barriers for women farmers. We are increasingly becoming the norm; either as half of a (often heterosexual) partnership or as entirely women-run farms. I will say that when we first applied for internships there was a woman-run farm that interviewed me and my husband separately over the phone, and it became apparent to me that they were applying the same kind of sexism they supposedly stand against. They asked me about my size and dietary habits, and asked if I considered myself "warm-blooded." They didn't ask my husband these things, but they did ask him if farming was his idea and if I was just "following along", which really riled me up because I was the instigator. So I do think there is still a lot of sexism out there, even where you'd least expect it. What personality characteristics do you have that drew you to farming in the first place? My passion for finding something I believed in and working hard to achieve my goals. My sense of humor, which is absolutely required in this line of work! My dedication to craft, to excelling and finding joy in the challenge. What has been the biggest reward? Of course having healthy baby animals born on the farm is incredibly rewarding, but the best feeling is having customers who appreciate me. Who are willing to spend extra money on our products because they understand the value of what we are doing and how hard we work. Knowing there are people out there who are willing to support us and want to see us succeed; that has been tremendously rewarding. What do you want your food to convey to others? I want my food to convey my passion, which is why we focus on ethically raised meat. It's easy for me to explain to my customers why our products are different, and most of them understand pretty readily. Education is at least 75% of my job when I'm at the farmer's markets. What do you wish people understood about farming? Everyone seems to understand that farmers are underpaid, but many people don't seem to understand the significance of that. We are tremendously underpaid for the amount of work we do, and for what we produce. If more people would pay higher wages for quality food, more farmers would be able to earn living wages and continue to produce food for our communities. This has been the hardest thing for us, as a small business in agriculture. How do we continue to do what we love and feed our community when we can't earn enough to keep the farm sustainable? Land access is one of the big challenges to smaller farmers. Do you own your land? Rent? Share? Land access is HUGE for us. We are currently leasing our land, and are extremely fortunate to have had the opportunities we have had thanks to our landlord. Unfortunately we are also in the flood plain, and are looking for high ground. The cost of land has skyrocketed in our area thanks to the burgeoning tech industry in nearby Bellevue and Seattle, and affording our own acreage seems beyond our grasp. Do you have a difficult time fitting it all in? Absolutely! I have yet to meet a small business owner or a farmer who didn't feel overworked. Someday we hope to be able to hire some help, but then we'll have to increase our production to pay for the help, which might put us back at square one. What was the most interesting challenge this past season? What will you do differently next season? This season I was worried about selling all my product, because we increased production of our broiler chickens substantially. I went to a lot of farmers markets, and while it was good to get the word out about our farm, it took me off the farm too much. Next season we might add a little on-farm storefront that people can come to and help themselves so we can keep working.